Constitutional scholar Amar (Law/Yale) argues that our understanding of the Bill of Rights has been distorted in two ways. First, he says, the practice of interpreting the Constitution as if clauses are discrete entities rather than part of a whole obscures how the Bill contributes to the establishment of popular sovereignty as well as protecting individual rights: “The genius of the Bill was not to downplay organizational structure but to deploy it; not to impede popular majorities but to empower them.” Second, the impact of the Fourteenth Amendment has been so great on 20th- century legal minds that we now view the Bill only in post-Reconstruction terms, obscuring its original meaning. 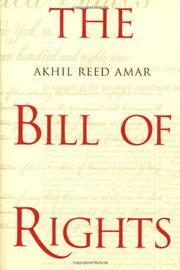 Amar proceeds by exploring the Bill of Rights as a historical document, stripping away presuppositions that have been added over the years and unveiling the intent of its authors in a clause-by-clause analysis. He then considers the implications of the Fourteenth Amendment for the Bill and specifically the problem of incorporation, i.e., to what extent the Bill is to be applied to actions of state, not just federal, governments. Amar assesses the alternative positions of Suspreme Court justices Frankfurter, Black, and Brennan, then returns to the work of 19th-century jurists to produce his own “refined” theory of incorporation. This is a more subtle approach to incorporating the Bill than he finds among 20th-century jurists, and he proceeds to use it as a guide in reconstructing the meaning of the post—Fourteenth Amendment Bill of Rights. The result enhances the reputation of the Reconstruction generation, for they “took a crumbling and somewhat obscure edifice, placed it on new, high ground, and remade it so that it truly would stand as a temple of liberty and justice for all,” even though the implications in practice are minimal. Impressive legal hair-splitting that may strike general readers as pointless.